Biotone Products used for Body Treatments and Massages: Dual Purpose Massage Creme used in therapeutic massages, contains Arnica extract and Ivy extract both our first choice for relief and provide added skin health and wellness benefits. Leave skin soft and smooth without any residue. Advanced Therapy Massage Lotion used in full body Swedish Massages, Based with Apricot oil to soften skin, Grapeseed oil for it’s exceptional light texture/non-greasy finish and Sesame oil to sooth and moisturize all skin types. Leaves skin with a light silky soft feel. Avocado & Carrot massage lotion used in full body Swedish Massage. Also after Spa Treatments such as Scrubs and Mud Wraps. Blended with deep moisturizing Avocado oil, vitamin fortified Carrot oil, Wheat Germ oil, healthy Sunflower oil, and healing Jojoba oil leaving skin soft and nourished. Peppermint & Lemon Peel Massage Lotion used on feet, containing extracts of Peppermint, Rosemary, Bay Laurel and Lemon Peel, work to repair and refresh. Sea Kelp and Aloe Vera added for their intense hydration and healing, leaves a soft powdery feel. 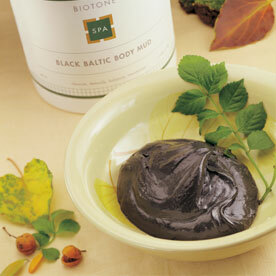 Black Baltic Body Mud, Rich in Natural Minerals, Humic Acid, Organic and Plant Materials. This smooth creamy Mud provides the highly effective benefits of black fresh water silts to maintain a healthy metabolism of the skin while assisting in absorbing impurities, removing toxins, and elevating moisture. This luxurious mud also contains nourishing Jojoba oil, Avocado, Peach and Sunflower oils. 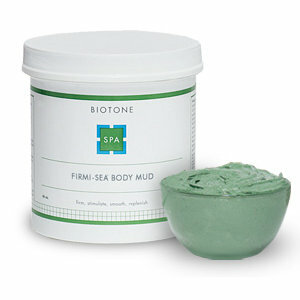 Firmi-Sea Body Mud, Provides an ocean full of active see weeds to penetrate the skin for the ultimate and purifying, firming and stimulating. Our specialized marine extracts Fucus Vesiculosis, Laminaria Digitata, Spirulina, Sea Rocket and Sea Fennel offer a wave of Minerals, Amino Acids and Trace Elements to rehydrate and repair skin, increase circulation and refined skin texture. This Luxurious Mud also contains nourishing to Jojoba, Avocado, Peach and Sunflower oils to further replenish dry or damage skin. 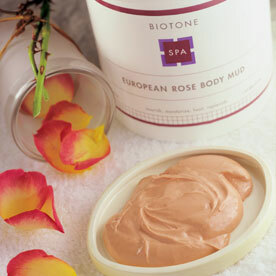 European Rose Body Mud, nourishes and hydrates to soften skin. This smooth creamy mud is ideal for total relaxation and skin beautification. This nutrient, skin reviving formula provides exceptional softening and smoothing with moisture-binding and refining Wheat Amino Acid, Apricot Amino Acid, Lactic Acid, and Rosa Centifolia. This luxurious mud also contains replenishing to Jojoba, Avocado, Peach and Sunflower oils. Exfoli-Sea Salt Glow this special formula utilizes three separate sizes of Dead Sea and Mineral Salts to create a three layer exfoliation to refine and improve skin texture like never before! This effective yet gentle formula increases circulation to let skin breathe while removing accumulated residues and skin impurities. Dead Sea Salts are known for their healing and therapeutic properties and have a considerably high content of minerals and trace elements to relax and sooth the body while providing a healthy radiant glow. Also contains replenishing Jojoba, Avocado, Peach and Sunflower oils. Pomegranate & Cranberry Customizing Complex, used in Mud Wraps and Body Scrubs. Contains Extracts of: Pomegranate, Cranberry, Almond, Wild Cherry Bark and Loquat. Aromatic blend. Mango & Mandarin Customizing Complex, used in Mud Wraps and Body Scrubs. Contains Essential Oils and Extracts of Mango, Mandarin, Pineapple, Quince, and White Peach. Aromatic blend. Milk & Honey Customizing Complex, used in Mud Wraps and Body Scrubs. Contains Extracts: of Honey, Milk Protein, Clover Blossom, Royal Jelly. Aromatic blend.